An outdoor patio can be the perfect setting for all your outdoor festivities. Finding the perfect fitting patio furniture can seem difficult at times. There are so many options available for dressing up your outdoor space. Placing a table with chairs on your patio can limit your available spacing. The average lawn chair really isn’t going to give your space the refined look you are going for. So what does that leave you with? You want to make your outdoor patio as inviting and relaxing as you possibly can. This means you want your furniture to be just as inviting. 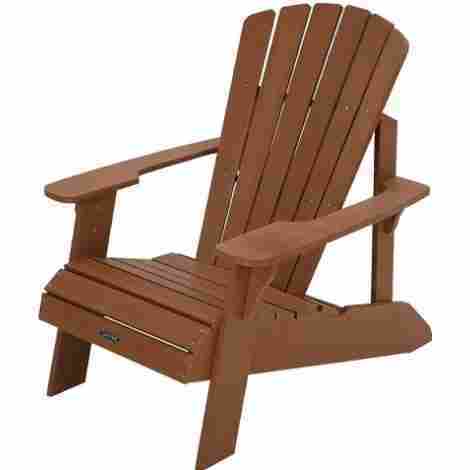 An Adirondack chair can provide you with an inviting and relaxed atmosphere. The chair has been around for years, although over the years there have been a few changes to materials and the design of the chair. 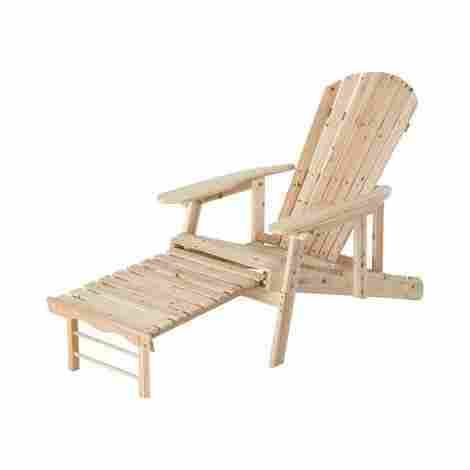 An Adirondack chair is low to the ground and is made for you to sit back and relax. Wide arms on the chair, provide ample leverage for getting out of the chair with ease. Pair the chair with a footstool, and you have the perfect relaxing scenario. Adding smaller tables to go with the chairs, gives you the feel of relaxing in your living room while enjoying the outdoors. The arrangement possibilities are endless for style and class with the Adirondack chair. Choosing the right Adirondack chair for you can seem somewhat daunting, once you have seen the number of options you have to choose from. 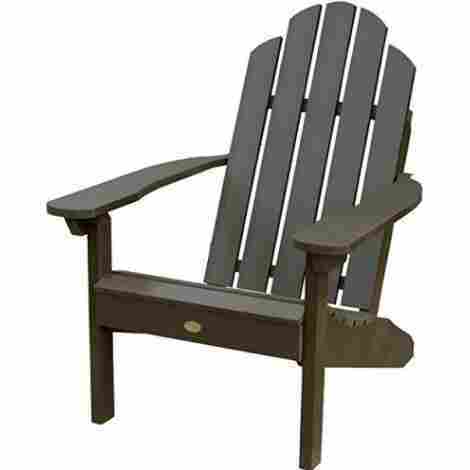 In order to choose which Adirondack chair will best suit your needs, you will need to consider the materials used in making the chair. Another feature you will need to consider is the color, as well as the design of the actual chair. An online review, such as this one, can help you sort through your choices before you make your final purchase. Below you will find what we consider to be the ten best Adirondack chairs on the market today. This chair offers you comfort and stability, while you relax in the great outdoors. Turn your patio into a functional, yet breathe taking space for you and your family to enjoy. Made from a durable material, these chairs are built to last you a lifetime of use. Used in the construction of the chair is high-quality hardware, which will resist the age-old battle with corrosion. 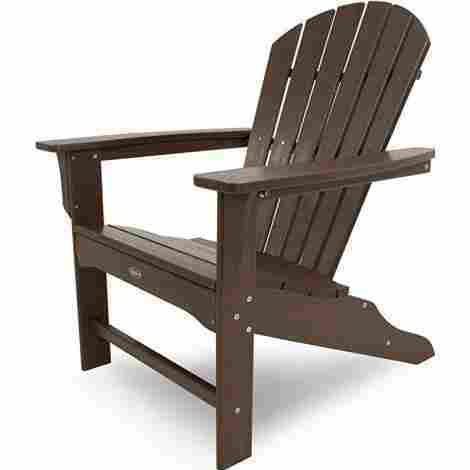 With the more traditional Adirondack chair design, all you have to do is kick back and enjoy the scenery. The contoured seat of the chair keeps you comfortable while reading your book, or chatting it up with your friends. These chairs offer you dependability while comforting your mind and body. With a few added accessories, you can turn your patio into your very own backyard oasis. 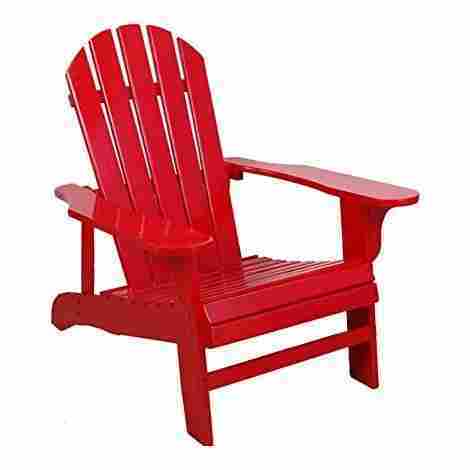 An Adirondack chair that can withstand all types of weather yet maintains its beautiful color. This chair can be taken on the run, allowing you to control your comfort where ever you go. Made from HDPE, the color of your chair is mixed throughout the material. This helps the chair resist the fading caused by mother nature and her elements. You can mix-n-match your color choices for a more unique patio arrangement. With the wide variety of color choices, you are sure to find one that pleases your taste. Once you have tried one of these chairs, you're not going to want to sit in any other types of lawn chairs. Good thing for you, you can fold these up, and take them where ever you're headed. Although these chairs have a higher cost than some others, they do offer the highest durability. With colors that resist fading and the wide variety of color options, these chairs are sure to please your whole family. This chair is very Eco-friendly, for those who choose to live the greener lifestyle. Offering you a comfortable seating option while enjoying the time around the fire with your loved ones. This chair is made from 100 percent recycled plastic, which makes it one of the more Eco-friendly options available. Using recycled plastic also gives you a durable from with a tested 500-pound weight capacity. That seems to be one tough chair! With the seat being more contoured, and the back slightly straightened, this chair offers you the comfort you deserve. You can kick back for hours in one of these without that stiff feeling upon getting up from the chair. Made from good quality materials, this chair is guaranteed to stand up to your environment. 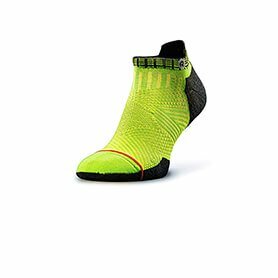 That alone is a quality worthy of the higher cost, the comfort level, and color selection is also hard to beat. The first real wood option on our list of Adirondack chairs. This chair offers you a built-in option for comfort, while you relax on your day off. Maintaining the beauty of this wood chair is practically effortless. Made from eucalyptus, this chair has much of the same qualities as a chair made from teak wood. Eucalyptus is a hardwood, which is known for resisting decay. You will also notice the wonderful color changing tones throughout the chair. To maintain the natural beauty of this chair, all you need to do is apply a coat of hardwood oil once per year. Doing this will preserve the integrity of the eucalyptus wood. The beauty of this chair alone will offset the cost. A genuine hardwood choice, these chairs will set your patio apart from the rest. Plus this chair offers you a built-in ottoman, for a more relaxing experience. This chair can brighten up your patio space with its color. Made from a combination of different woods, the unique pattern design will create a fresh look to your backyard. 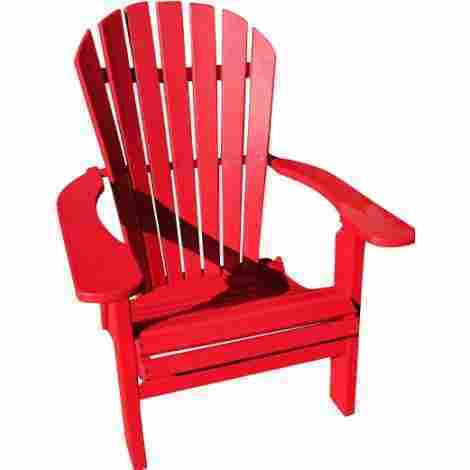 Coated in a red paint, which protects this chair against the weather, you can brighten up your outdoor living space. This chair will definitely be a centerpiece of discussion among your friends. To set this chair apart from the rest, it has been constructed with a unique pattern. The planks of wood are set in more of a fanned pattern, giving this chair a style all of its own. At the very little cost to you, you have the possibility to add a little flair to the design of your backyard. The brightly painted red chair is protected against the weather from the paint. This model of chair will require virtually no effort to maintain the great look it provides. Since this chair comes in a variety of color choices, you can certainly play around with your color scheme. In order to keep your chair looking great, all you do is simply wipe the chair with a damp cloth. This will clean away any residual dirt on the chair from regular use. These chairs will not require any staining, painting, or oiling. Since this chair comes in seven color choices, you can change things up a bit by mix-n-matching your colors. So if you need four chairs you can pair the colors according to your preferences. To get good quality you have to be willing to spend a little more, that is the case here as well. For slightly more, you get a long lasting chair, that is easy to care for. Most of your time can be spent relaxing, rather than painting or staining. These chairs come designed with your relaxing capabilities in mind. A wood option that comes already finished for you, so no need to stain or oil these right off the bat. Simply set them out and enjoy your relaxing time. Made with wider arms, giving you the ability to easily get in and out of the chair. Wider arms also eliminate the need for extra tables, as they are wide enough to set a smaller size plate on. These chairs come with a layer of both stain and oil. All you have to do to enjoy these chairs is simply set them up in your available space. This eliminates the need to purchase stain right away, and the work that comes with it. Coming in at a more average price point, these chairs offer you comfort and style. Set these up in your backyard or patio space for use right away. These are already finished for you, which lets you enjoy the more free time. This model of chair provides you with another folding option for portability. Since it is left in the natural state, you are free to use your inspiration to change the look of the wood for this chair. This chair is made from cedar and left in the natural state. This allows you to choose the stain color of your choice. Use your own creativity to inspire a beautiful outdoor space to enjoy. This chair folds down nicely, making it easy to carry along on all your traveling adventures. Even if you don,t intend to bring this chair along, folding them down eliminates the space you will need for storage as well. This chair provides you with an empty canvas, to get creative with your own space. Folding allows for easy travel and less storage spacing. These are both great qualities for an outdoor chair. Made from a durable form of plastic these chairs offer you comfort and stability. Choose your favorite color, for a splash of excitement, or go with something more traditional if you would like. With a contoured design to both the seat and back of this chair, you can be sure your guests will be relaxed. These chairs also have a slightly higher back design, for your taller friends comfort. With having several different color options, you can choose something flashy, to brighten your space. Maybe you prefer something more traditional, in that case, there are color options available for you as well. Made from a durable form of plastic, these chairs are built to last you for years to come. Having the ability to choose your color scheme allows you to personalize your patio more to your liking. The last chair on our list is one that allows you to snooze in the afternoon sun. It will also function as a normal chair, for those days that you're enjoying your morning coffee. Made from cedar, and left in the natural state, you have an open canvas at your disposal. The design of this chair allows you to kick back and put your feet up. The back of the chair reclines, while the footrest can be extended for putting up. Feel free to take a quick snooze, while relaxing in your backyard. The chair is constructed from cedar, which is known for resisting damage caused by moisture. It also has a distinct color tone all its own, which can be enhanced when the stain is applied. Since this chair comes in a natural state, you could also choose to paint the chair for further protection against the weather. As one of the lower cost options on this list, this chair offers you comfort and affordability. You can choose to leave the appearance of the chair alone, or add stain to enhance the tones of the cedar. Once you have selected the perfect Adirondack chair to match the style and setting of your outdoor patio, all that’s left for you to do is relax. Let the warm weather, party planning, and all around fun begin. 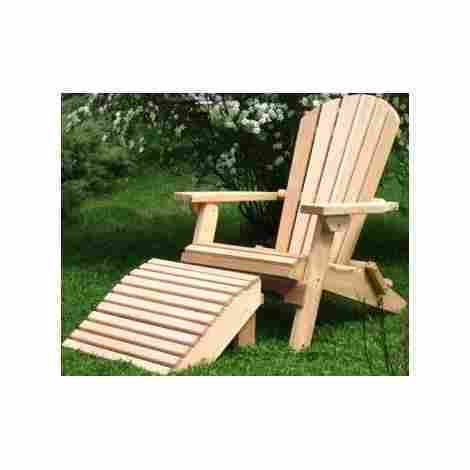 There are a wide variety of materials used to build an Adirondack chair. To choose which one will work best for your situation there are several factors for you to consider. For example, you will want to choose a material that is durable, this will allow the chair to withstand the elements when left outdoors. Caring for your chair should also be a consideration, some people will choose a material the doesn’t require much upkeep. Choose a chair that will fit the design of your outdoor patio, as well as one made from materials that will still look great for years to come. If you will need to move the chairs around, you may want to consider a material that is lighter in weight. Lastly, consider the price of the chairs, if you need several choose a chair that fits well within your budget. Teak is a type of wood that holds more potential than some of the other wood choices on the market. There is less upkeep when it comes to teak, plus it tends to be more resistant to nicks and scratches. Chairs made from teak have the capabilities to be left outside all year long as it is a durable material. Adirondack chairs made from teak will only be available in one color and are quite a bit pricier than some of the other choices for material. Adirondack chairs made out of aluminum are rarer to find, however, they are lightweight and durable. These chairs are resistant to all types of weather, which also makes them resistant to corrosion. This is one of the lowest in price for chair materials, but might not be a great choice if you live in an area that has high winds. Chairs made from aluminum are not as aesthetically pleasing as other material options from which you can choose. They are also known to be a little less pleasing in the comfort area. Don’t let the name fool you, high-density polyethylene lumber is actually a synthetic material used to build long lasting, great looking outdoor furniture. Chairs made from HDPE are easy to clean while being one of the more comfortable choices for chair materials. This option also gives you the largest selections for color, while having the longest lifespan as well. The only downfall reported with this material is the cost, but when thinking of the long run, purchasing replacement furniture won’t be necessary. Chairs made from plastic are relatively low in cost, yet easy to clean and maintain. These chairs will come in a wide variety of color options and will withstand some weathering. They are not always as durable as some of the other material choices, making them a better option as a set of extra chairs rather than your main furniture choice. 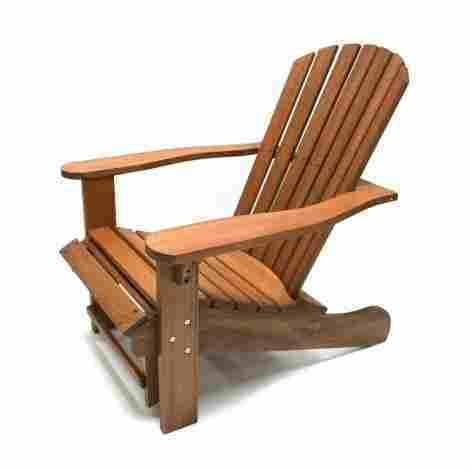 There is a vast array of wood types used to build an Adirondack chair. Each type of wood offers a unique quality all it’s own to offer the chair. Take cedar, for example, it offers a pleasant scent, while being resistant to damage caused by moisture. Another great example would be mahogany, which is known to resist scratches. When cared for properly, mahogany can maintain it’s beauty and scratch resistance for years to come. Before choosing a type of wood, consider what type of climate and weather conditions your chair will be out in. The measurements for an Adirondack chair will sometimes differ, you can find chairs that their height ranges anywhere from 36-42 inches. Depending on the width of your chair, which can be 30-34 inches wide, you may want to center your floor plan accordingly. The depth of the chairs will also vary, typically falling between 35-38 inches deep. The weight of your chair will depend on the material used to build the chair. A chair on the lighter side might way 15 pounds, while one on the heavier side may weigh 45 pounds. In the event you plan to move these chairs around frequently, you may want to choose chairs that are at the lower end of the scale for weight. It is best to think about having your chairs vary in height, this will accommodate your guests in the comfort area a little better. A person who is slightly shorter will find it easier to use a chair that has a seat that is lower to the ground. While your slightly taller guest will appreciate a chair with a seat that is not as low to the ground. You can find chairs with seat heights ranging from 14-16 inches in height. Having several options for your guests will add to the atmosphere you have created. Knowing how to space your chairs can help you plan how many chairs you will need for your available space. It is recommended that you place your chairs at least 3 feet apart while leaving another 3 feet in front of the chair cleared. Keeping the space in front of the chair cleared will make getting in and out much easier. Now let’s say that you have a patio that is at least ten square feet, if you follow these spacing guidelines, you can fit three to four chairs comfortably in this spacing. This category may tend to vary depending on the actual manufacturer of the chair, but in most cases, you will be able to find an Adirondack chair in its classic form. Some manufacturers have taken the initiative to add their own spin to the design over the years. You can find these chairs in an over-sized version, which offers plenty of room for movement while seated in the chair. In some instances these chairs have been designed to fold, making them much more portable than ever before. Every manufacturer should have a brief description of their designed style for the chair, letting you know just what you’re getting when you purchase their product. To spruce up your patio space, you can choose to accessorize your new chairs as well. Choosing to pair them with a footstool, can add to your relaxing space, allowing you or your guests to really kick back. Smaller sized tables between the chairs make the patio spacing seem more inviting as well. Also available for the chairs are cushions or accent pillows, which give the chairs a more warm appearance. Really as far as accessorizing your patio space goes, the possibilities are endless. Q: How do I care for my Adirondack chair? 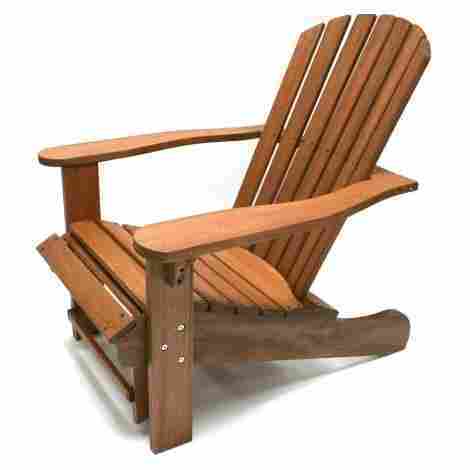 A: Adirondack chairs can be found in an array of different material choices. Each material will require different steps for cleaning and maintenance. It is best to check the manufacturer’s specifications for cleaning and care. Below is a quick reference for cleaning your chair according to the material used to make your chair. The plastic chairs can be cleaned with water and mild detergent, just by wiping them down. For seemingly tougher stains, you can use diluted forms of household cleaners. Another option, these chairs can withstand the pressure of your garden hose, so they could also be washed clean with the hose. Chairs made from unfinished wood products should never be exposed to water for any length of time. You can, however, use a mild detergent with a wet rag to remove tough stains, making sure to dry the chair promptly to avoid water damage. Mainly these chairs should be wiped free of dirt and debris with a dry rag. Chairs made from finished wood materials, such as stained or painted wood, can be cleaned with a mild detergent then dried. For those stuck on stains, you can also try using wood cleaner by following the directions on the cleaner of your choice. Q: Do you have to apply stain to unfinished Adirondack chairs? A: No, you won’t have to apply stain to the unfinished wood chairs. When left alone, these chairs will go through a natural weathering process, which may change the color of the chair. But rest assured that it will not affect the sound structure of the chair. Q: Which Adirondack chair materials are the most durable? A: For the most durable chair, it is recommended that you go with a chair made from high-density polyethylene lumber. HDPE is a synthetic blend that creates a more durable form of plastic material, these offer the highest amount of durability. Their color also withstands the weather better than other materials available, which gives you a better-looking chair as the year’s pass. Q: Is the hardware used to make the chairs dependable? 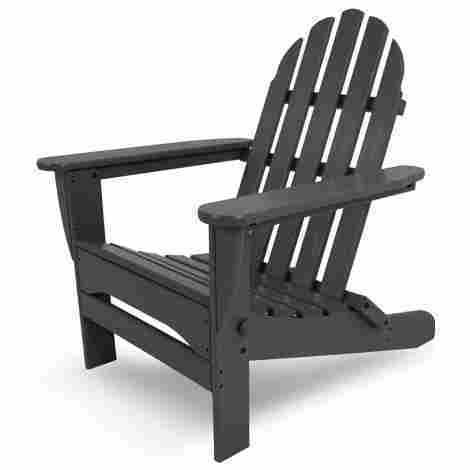 A: Yes, most Adirondack chair manufacturers will use a high-quality steel hardware for constructing their chairs. This means they will be resistant to corrosion, keeping them from becoming an eyesore in your beautiful patio space.